The patented Saberjet nozzle is a truly multi-purpose nozzle with the penetration of a solid bore tip and the safety of a fog pattern. The Single Shutoff Saberjet has a unique three position handle and ball to give you solid bore, fog or closed positions. The Dual Shutoff Saberjet allows you to flow both solid bore and fog stream at the same time. 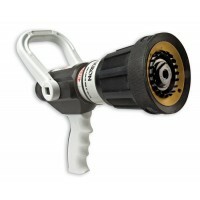 This one of a kind nozzle is ideal for multiple applications. 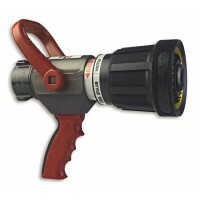 The ultimate CAFS nozzle.